Goodoffer24 Review and Coupons: Is it Legit? Are you looking to buy affordable software keys? Check below our Goodoffer24 review, containing details about this website and how to buy software and games keys using it. The so called “CD Keys” have proliferated in the past years, and it is easy to understand why. Many of them offer cheaper game and software keys then you would get otherwise. On top of that, their support is frequently better than you would get from your software provider. While software companies have to handle coding, producing and distributing software, these companies ar specialized in one thing: selling it efficiently. Today, we have a new site in this niche to review. 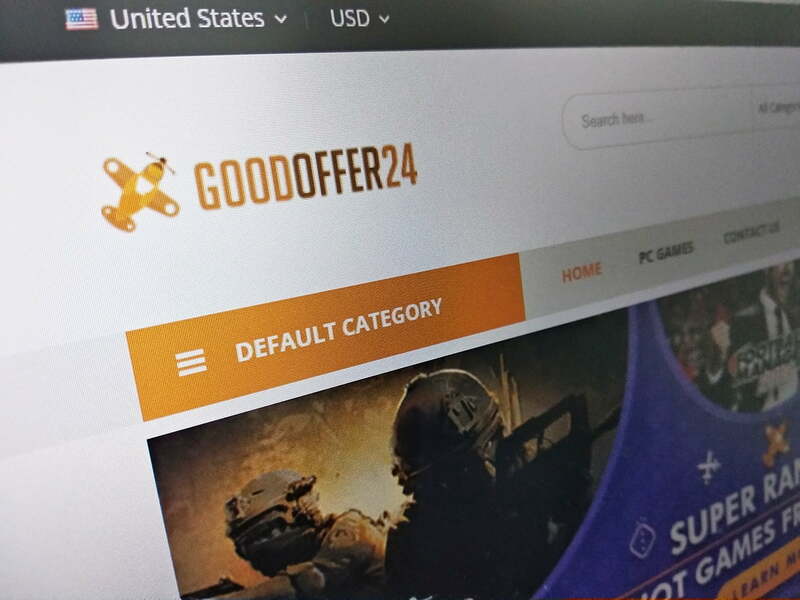 Our Goodoffer24 review brings an in-depth opinion about the website key features, including user experience, order processing and support. What is Goodoffer24? Is it Legit or a Scam? Goodoffer24 is a relatively new website selling both software and game keys. What surprises me the most about it is, that, despite being relatively new, it has a great infrastructure. The company is established in Hong Kong, like many other giants in the software and game keys business. Therefore we can conclude that Goodoffer24 is a pretty legit. Moreover, they are also marked as a trusted shop on allkeyshop.com, one of the biggest sites reviewing game key marketplaces. In Goodoffer24 you can find keys for most types of products found in similar and bigger software key portals, such as G2A, Kinguin and cdkeys.com. What Are the Advantages of Buying Software Keys on Goodoffer24? Well, there are a few advantages to point in buying software and game keys on Goodoffer24. The main advantage in my opinion is the combination of low prices, fast delivery and the fact that Goodoffer24 is pretty reliable. Buying keys on sites like that seems to be a trend that is here to stay. Buying software on Goodoffer24 is as simple as buying in any other software or game key website. If you have no experience with that, firstly you have to create your account, and make sure you use a valid email. Then you can follow to the next step of placing the order, and going to the check-out. While check-out you can choose one of the available payment methods (see below), and finish your purchase. Your key should be available on your email in minutes. One of the most important things you should consider when buying software online is their payment methods. It is preferable that the website accept various payment options, this way the user can choose what is more convenient to make the purchase. In the case of Goodoffer24, you have a very good amount of payment options to choose from. They include PayPal, JCB, Visa and MasterCard as well as paysafecard. Another important aspect I consider when using any type of online service is how fast and reliable is their customer support. The most common problem with support in my experience from other sites is their time to reply a ticket. Goodoffer24 has a relatively fast reply rate, especially during working days. 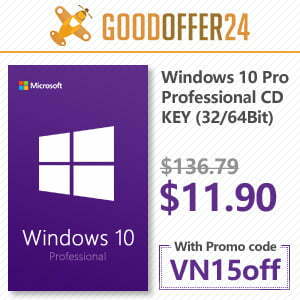 You can use the coupon VN15off for an amazing discount when purchasing software on Goodoffer24.com. Even if most of the link above are for software, Goodoffer24 also offers a wide variety of games, which is, in my personal opinion, one of its highlights. Those are the main points in our Goodoffer24 review, I hope you can find this useful for your user experience and next software and game purchases. Have you used or are you planning to use Goodoffer24 in the near future? Leave your thoughts and questions in the comment box below. This site is likely reselling MSDN licenses. They are genuine Microsoft product keys, they are actually retail licenses, but it is intended for a particular product channel either the Microsoft Software Developer Network (MSDN) or TechNet for IT Professionals who pay a subscription fee. The main purpose is for evaluation purposes. The great thing about them, unlike trial Microsoft software, MSDN or TechNet keys don’t expire. Because the agreement under which the subscription is provided is a single license, none of the software should be distributed outside of it. Even though its $50,000 worth of licenses, it is for one person only to use and no one else. Unfortunately, regardless of the licensing terms, persons still abuse the program, either giveaway product keys or resell it on auction sites. Microsoft licenses it in good faith that customers won’t do so, but I guess human nature wins out. In your case, what probably happened is, you bought an MSDN licensed key, which carries up to 10 activations unlike full packaged retail licenses which only carry 1 activation. The person who sold it to you probably sold it to 10 other persons. Somewhere along the way, one of those persons might have installed it on a second system, activated it, because it went past 10 activation threshold, Microsoft detected it that it was being abused and blocked the key from further use. I bought a key and it was delivered. 2 weeks after I ordered another one but nothing was sent to me. I sent many e-mail but I got no reply! !